Se voces estiverem passando pela California - USA, mais precisamente em West Hollywood, nao deixem de passar pela Carmichael Gallery e ver a exposicao da Thais Beltrame. When All The Stars Are Gone, the first US solo exhibition of work by Brazilian artist Thais Beltrame, comes to LA’s Carmichael Gallery on Thursday, May 7th, 2009 from 7– 10pm, with the artist in attendance. A new series of ink and watercolor works on paper will be on display, as well as a site-specific installation. 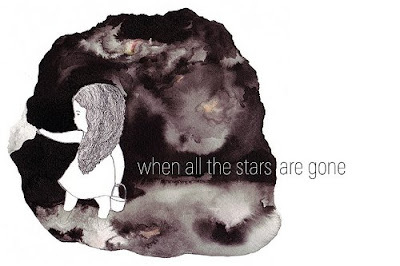 Thais’ When All The Stars Are Gone is a poetic glimpse of the world as perceived by the artist. Looking to the skies for inspiration, the artist reflects upon solitude, beauty, and the transient nature of being. In this newest body of work, Thais’ trademark wistful children are changing, growing stronger, wiser, and more aware of their surroundings. From this growth emerge new fears and dilemmas, however, as observed in the artist’s shift from negative space to a brooding application of earthy watercolors. About the Artist: Thais Beltrame was born and lives in Sao Paulo. The largely self-taught artist grew up amongst a generation of Brazilian counter-culture in the 80s and 90s. Highly regarded for her subtle, distinctive style, she is the sole female member of the powerhouse Brazilian art collective, the Famiglia Baglione . Thais has exhibited her work in the United States, United Kingdom, and Brazil. Carmichael Gallery is located at 1257 N. La Brea Avenue, on the SW corner of La Brea and Fountain, West Hollywood, CA 90038. Gallery hours are Tuesday through Sunday, 1 p.m. to 7 p.m., and by appointment. For more information, please visit our website www.carmichaelgallery.com, email art@carmichaelgallery.com, or call 323.969.0600.